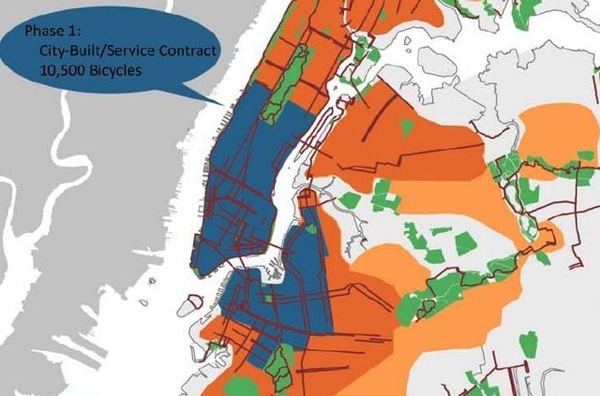 The Brooklyn Paper reports that the city’s proposed bike share program omits “bike kiosks east of Bushwick Avenue and McGuinness Boulevard, where an estimated 30,000 of transit-starved residents live”. Despite the typically breathless Brooklyn Paper headline, this is not news. In fact, the plan all along (as shown in the map at right) has been to limit the pilot program to lower Manhattan, downtown Brooklyn and parts of North Brooklyn. So yes, transit-starved residents of East Williamsburg and the eastern reaches of Greenpoint will not have access to bike sharing on their block until phase 2 of the program. Nor will residents of the Upper East Side, the Upper West Side, Harlem, Washington Heights, Inwood, the Bronx, Queens, Red Hook, Sunset Park, Crown Heights, Flatbush, the South Slope, Bushwick, East New York and one or two other neighborhoods. It’s not clear if the phasing is driven by the vendor (Alta) or the city, but it does seem to be a factor of the initial number of bikes in the program – 10,000 bikes – and a 2009 City Planning study that determined the optimal number of bike slots per station – 24. With 10,000 bikes, there is only capacity for 600 stations.